Durham’s Second XI will spread their home fixtures around six separate grounds this summer. The Second XI Championship begins with a trip to the newly-sponsored Emerald Headingley to face Yorkshire over three days on May 9-11. Durham’s home Championship games have been arranged, with Northants heading to the Emirates Riverside on May 22-24, Lancashire playing there on June 5-7, Derbyshire coming north to Burnopfield on June 26-28 and the MCC Yoiung Cricketers providing the opposition at South Northumberland on July 10-12. The Second XI Trophy begins the competitive campaign on Tuesday, May 8, also against Yorkshire in Leeds. 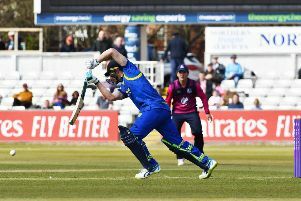 The home Trophy ties see Durham entertaining Worcestershire at Hartlepool’s Park Drive home on May 17, with Northants and Lancashire visiting the Emirates Riverside on May 21 and June 4 respectively. Durham’s T20 programme starts away to Warwickshire on May 14. Durham host Yorkshire at Brandon on June 19, Derbyshire at Burnopfield on June 25 and the MCC Young Cricketers at South Northumberland on July 9. Durham seconds have four pre-season friendlies arranged, They visit Middlesex for a four-day clash, starting on Monday. After that, Leicestershire are at Brandon for a one-day friendly on April 24 before a three-day fixture at the Emirates Riverside. Scotland visit Burnopfield for a three-day friendly on April 30-May 2. Durham also have a three-day friendly against Essex at Chester-le-Street CC’s Ropery Lane ground on August 20-22, and a one-dayer 24 hours later at Brandon.